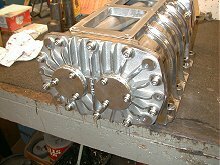 Once the bearings are seated the bearing end covers are installed. Torque these covers with care. It's now time to turn it around again and install the rear bearings. 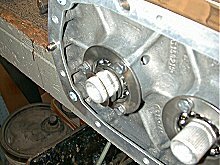 These are a pre-lubed bearing. Press them in flush. Make sure to use the right size tool to press the bearings in. You don't want to damage a bearing installing it. 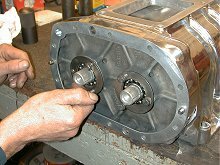 Once the bearings are in you can install the end plates and torque them in place. 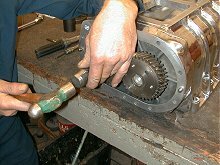 The clearance between the rotors is adjusted or set by using shims to space the helical gears in or out. We took note of the shim placement when we disassembled the blower and will put it back the same as a starting point. 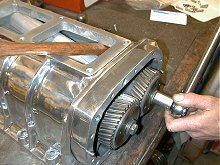 The gears are tapped on making sure that the larger serration on the shaft lines up with the larger serration in each gear. 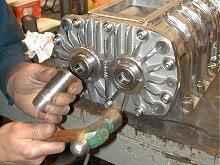 The gears will need to be torqued in place to check the rotor tolerance. Torque these by inserting a wooden handle between the rotor and case so the rotors wont turn.